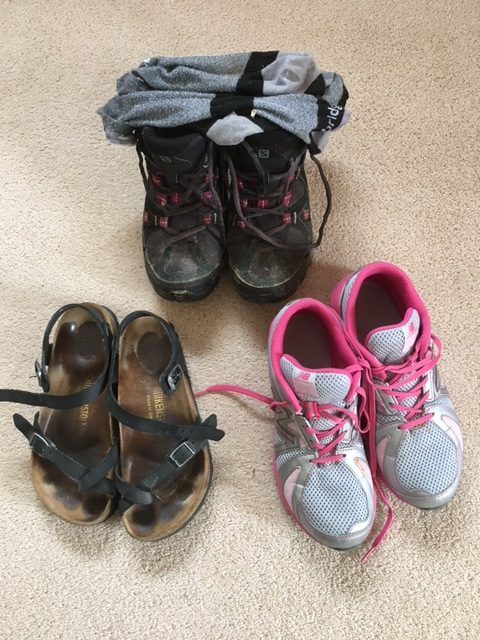 Home » Uncategorized » More about feet and Parkinson’s. Dear Elspeth, what a nuisance feet can be!!! I too rejected Hotter shoes until last year when I tried on a pair and found them so comfortable that I also bought some sandals in the summer. Sometimes one just has to lower one’s pride. I am impressed that you are managing to enjoy walking in your lovely part of the world even though your foot is proving difficult. Keep up the good work. Lovely to look forward to Australia and your grandparenting duties next year. Hopefully Barbara will organise another lunch before you disappear again. Lovely to read another update and I certainly empathise with the Hotter or similar magazine felling through the letter box. Hiwever knowing how much pain your foot problems cause anything which helps must be the way forward. Perhaps you could turn the Hotter’ into a fashion statement by adding sparkly adornments !! Good luck with your nurse and hope she can come up with some workable suggestions – my experience with bespoke orthotics was not very successful but perhaps it depends on the condition they are treating. Great news re next visit down under and oh what fun you will have with a mobile Henry!